With John McCain's passing, a powerful voice for American global leadership has been silenced — United States Studies Centre . A US Senator since 1986, Senator McCain was the most senior and most trenchant Republican critic of President Donald Trump. He was his party's Presidential nominee in 2008, a naval veteran and war hero who chaired the Senate Armed Services Committee, one of the most powerful positions in the American Congress. 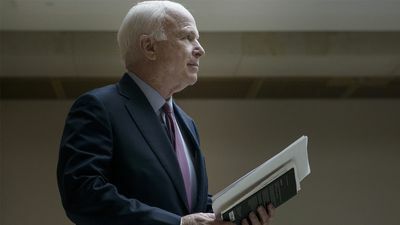 Senator McCain was unabashedly a conservative — succeeding Barry Goldwater as a senator from Arizona — but would reach across the partisan divide for great causes. Landmark legislation from 2002 regulating the financing of political campaigns bears his name, along with Democrat Russ Feingold. Senator McCain led a long struggle to remove "earmarks" or pork-barrel amendments from the American legislative process, annoying Republican and Democrats alike. Senator McCain was also part of an "internationalist" bipartisan coalition in the Senate that would vote for free trade (the North American Free Trade Agreement chief among them) and to supporting and expanding NATO after the fall of the Soviet Union, with Joe Biden among the like-minded Democrats on these critical votes in the US Senate. Senator McCain's colleague John Kerry, the Democratic candidate for president in 2004, asked him to be his running mate — Senator McCain refused. Four years later, as the Republican nominee for president, Senator McCain is said to have deeply wanted his Democratic Senate colleague Joe Lieberman to be his running mate. Instead, he went with Sarah Palin. Ms Palin's presence on the national stage — and the subsequent emboldening of similarly populist voices in American politics — must also be considered part of his legacy. Many American allies would have described him as their greatest friend in the US Congress. This was certainly true for Australia. He offered reassurance to Australia after the famously brusque Trump-Turnbull phone call, openly criticising Mr Trump for an "unnecessary and frankly harmful open dispute" just weeks into Mr Trump's presidency, a remarkable act by a senior senator from the same party as the President. But for years prior, Australian prime ministers, foreign ministers, defence ministers, ambassadors, diplomats and members of our defence forces knew of Senator McCain's commitment to the US-Australia relationship, made manifest through his stewardship and influence as chair of the Senate Armed Services Committee, ensuring other US legislators would also devote time and attention to the US-Australia relationship. Last year — in what would be his last international trip — the United States Studies Centre in Sydney hosted an address by Senator McCain. The State Library of New South Wales made the Mitchell Library Reading Room available for the occasion, one of only a handful of times the magnificent room has been used for a public event in its 100-year history. Senator McCain noted his grandfather had steamed into Sydney Harbour as part of the Great White Fleet over 100 years earlier in 1908, returning to the South Pacific as a commander in World War II, that his father captained a US Navy submarine operating out of Perth in World War II, that he himself enjoyed the "cultural amenities" of Kings Cross while on R&R during the Vietnam conflict, and that his sons served alongside Australian personnel in Iraq and Afghanistan. After his speech, we presented Senator McCain with the most Australian of gifts, an Akubra hat. I placed my hand on his shoulder has he came down from the stage, and immediately realised why he hadn't posed with his new Akubra. Senator McCain's sacrifice for his country was written on his body, a constant reminder to himself and those around him — of the seriousness of the enterprise of statecraft, be it pursued while wearing a suit or a uniform. His body was savaged as he ejected from his plane over Hanoi in 1967 and twisted by five years of captivity as a prisoner of war. For as long as I can remember, Senator McCain struggled to raise his arms above his shoulder, a fact we'd forgotten when coming up with the Akubra as our gift. Just a few weeks later, Senator McCain would be diagnosed with brain cancer, another physical torment endured while continuing to serve his nation. Domestic politics is often said to stop at the water's edge: that is, while abroad, politicians don't criticise the governments or leaders of their home countries. But in his address to the US Studies Centre last year, Senator McCain did not shy away from conceding that Mr Trump was "unsettling" American allies, or that there is a debate underway in the United States about its role in the world, its resolution uncertain. That debate continues after Senator McCain's passing, with one of the most powerful and passionate voices for American global leadership silenced, amid great uncertainty as to who in the US Congress will advance his legacy and the case of American internationalism.